Cosmology is study of the Universe in its totality, and by extension, humanity's place in it. Though the word cosmology is recent (first used in 1730 in Christian Wolff's Cosmologia Generalis), study of the Universe has a long history involving science, philosophy, esotericism, and religion. In recent times, physics and astrophysics have come to play a central role in shaping the understanding of the universe through scientific observation and experiment; or what is known as physical cosmology shaped through both mathematics and observation in the analysis of the whole universe. In other words, in this discipline, which focuses on the universe as it exists on the largest scale and at the earliest moments, is generally understood to begin with the big bang (possibly combined with cosmic inflation) - an expansion of space from which the Universe itself is thought to have emerged 13.7 billion years ago. From its violent beginnings and until its various speculative ends, cosmologists propose that the history of the Universe has been governed entirely by physical laws. Theories of an impersonal universe governed by physical laws were first proposed by Roger Bacon, a somewhat persecuted member of the Catholic Church. Between the domains of religion and science, stands the philosophical perspective of metaphysical cosmology. This ancient field of study seeks to draw intuitive conclusions about the nature of the universe, man, god and/or their relationships based on the extension of some set of presumed facts borrowed from spiritual experience and/or observation. This is the purpose of the ancient metaphysical cosmology. However, Stoicism rejected Aristotle's theory of universals as being "in the things themselves," calling them "figments of the mind." Stanford Encyclopedia of Philosophy adopting the concept of universals as being "concepts," and therefore of the mind, and therefore controllable by free will. Thus, we get the analysis of Aurelius' that the nature of the universe is not from "intuition," but from a free-will, conceptual understanding of the nature of the universe. Cosmology is often an important aspect of the creation myths of religions that seek to explain the existence and nature of reality. In some cases, views about the creation (cosmogony) and destruction (eschatology) of the universe play a central role in shaping a framework of religious cosmology for understanding humanity's role in the universe. Physical cosmology is the branch of physics and astrophysics that deals with the study of the physical origins and evolution of the Universe. It also includes the study of the nature of the Universe on its very largest scales. In its earliest form it was what is now known as celestial mechanics, the study of the heavens. The Greek philosophers Aristarchus of Samos, Aristotle and Ptolemy proposed different cosmological theories. In particular, the geocentric Ptolemaic system was the accepted theory to explain the motion of the heavens until Nicolaus Copernicus, and subsequently Johannes Kepler and Galileo Galilei proposed a heliocentric system in the 16th century. This is known as one of the most famous examples of epistemological rupture in physical cosmology. Isaac Newton's 1687 publication of Principia Mathematica, the problem of the motion of the heavens was finally solved. Newton provided a physical mechanism for Kepler's laws and his law of universal gravitation allowed the anomalies in previous systems, caused by gravitational interaction between the planets, to be resolved. A fundamental difference between Newton's cosmology and those preceding it was the Copernican principle that the bodies on earth obey the same physical laws as all the celestial bodies. This was a crucial philosophical advance in physical cosmology. Modern scientific cosmology is usually considered to have begun in 1917 with Albert Einstein's publication of his final modification of general relativity in the paper "Cosmological Considerations of the General Theory of Relativity," (although this paper was not widely available outside of Germany until the end of World War I). General relativity prompted cosmogonists such as Willem de Sitter, Karl Schwarzschild and Arthur Eddington to explore the astronomical consequences of the theory, which enhanced the growing ability of astronomers to study very distant objects. Prior to this (and for some time afterwards), physicists assumed that the Universe was static and unchanging. In parallel to this dynamic approach to cosmology, a debate was unfolding regarding the nature of the cosmos itself. On the one hand, Mount Wilson astronomer Harlow Shapley championed the model of a cosmos made up of the Milky Way star system only. Heber D. Curtis, on the other hand, suggested spiral nebulae were star systems in their own right, island universes. This difference of ideas came to a climax with the organization of the Great Debate at the meeting of the (US) National Academy of Sciences in Washington on 26 April 1920. The resolution of the debate on the structure of the cosmos came with the detection of novae in the Andromeda galaxy by Edwin Hubble in 1923 and 1924. Their distance established spiral nebulae well beyond the edge of the Milky Way and as galaxies of their own. Subsequent modeling of the universe explored the possibility that the cosmological constant introduced by Einstein in his 1917 paper may result in an expanding universe, depending on its value. Thus the big bang theory was proposed by the Belgian priest Georges Lema”tre in 1927 which was subsequently corroborated by Edwin Hubble's discovery of the red shift in 1929 and later by the discovery of the cosmic microwave background radiation by Arno Penzias and Robert Woodrow Wilson in 1964. These findings were a first step to rule out some of many alternative physical cosmologies. What is the ultimate reason for the existence of the Universe? Does the cosmos have a purpose? Many world religions have creation myths that explain the beginnings of the Universe and life. Often these are derived from scriptural teachings and held to be part of the faith's dogma, but in some cases these are also extended through the use of philosophical and metaphysical arguments. In some creation myths, the universe was created by a direct act of a god or gods who are also responsible for the creation of humanity (see creationism). In many cases, religious cosmologies also foretell the end of the Universe, either through another divine act or as part of the original design. Islam relies on understanding from the Qur'an as its major source for explaining cosmology. A complex mixture of native Vedic gods, spirits, and demons, overlaid with imported Hindu and Buddhist deities, beliefs, and practices are the key to the Sri Lankan cosmology. The Australian Aboriginal concept of Dreaming explains the creation of the universe as an eternal continuum; "everywhen". Through certain ceremonies, the past "opens up" and comes into the present. Each topographical feature is a manifestation of dormant creation spirits; each individual has personal Dreamings and ceremonial responsibilities to look after the spirits/land, determined at birth, within this belief framework. Many religions accept the findings of physical cosmology, in particular the Big Bang, and some, such as the Roman Catholic Church, have embraced it as suggesting a philosophical first cause. Others have tried to use the methodology of science to advocate for their own religious cosmology, as in intelligent design or creationist cosmologies. Many esoteric and occult teachings involve highly elaborate cosmologies. These constitute a "map" of the Universe and of states of existences and consciousness according to the worldview of that particular doctrine. Such cosmologies cover many of the same concerns also addressed by religious and philosophical cosmology, such as the origin, purpose, and destiny of the Universe and of consciousness and the nature of existence. For this reason it is difficult to distinguish where religion or philosophy end and esotericism and/or occultism begins. Common themes addressed in esoteric cosmology are emanation, involution, evolution, epigenesis, planes of existence, hierarchies of spiritual beings, cosmic cycles (e.g., cosmic year, Yuga), yogic or spiritual disciplines, and references to altered states of consciousness. Examples of esoteric cosmologies can be found in modern Theosophy, Gnosticism, Tantra (especially Kashmir Shaivism), Kabbalah, or Sufism. 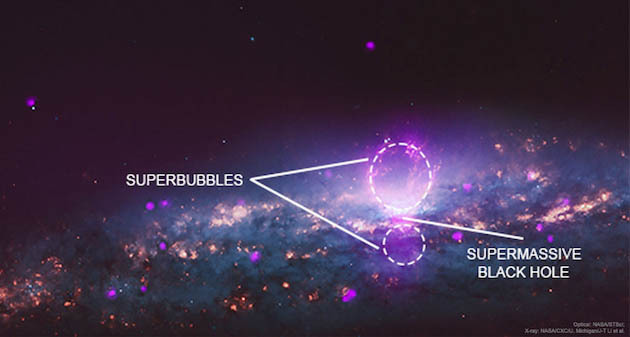 The superbubbles, shown in purple, emit so much energy and are so hot they emit X-rays. The 'extremely energetic cosmic rays' that are generated in their formation have been detected and captured by a combination of radio, X-ray, and optical imaging from NASA. The X-rays were picked up by NASA's Chandra X-ray observatory, and together with optical data from the NASA's Hubble Telescope, the space agency was able to create both wide field and close-up images of the phenomena. According to NASA, the bubbles, which are shown in purple in images, are located in the spiral galaxy known as NGC 3079 which is 50 million light-years away from Earth. The bigger of the two bubbles spans 4,900 light years in diameter and the smaller is 3,600 light years across. Environmental variables, such as cosmic rays, solar activity, and electromagnetic waves in the Earth's atmosphere, may account for about 2-8 percent of heart rate variability. Cosmic rays have interested scientists for many different reasons. They come from all directions in space, and the origination of many of these cosmic rays is unknown. NASA's website explains Schumann resonances: There is a 'cavity' defined by the surface of the Earth and the inner edge of the ionosphere 55 kilometers [34 miles] up. ... The Schumann resonances are quasi standing wave electromagnetic waves that exist in this cavity. Like waves on a spring, they are not present all the time, but have to be 'excited' to be observed. They are not caused by anything internal to the Earth, its crust or its core. They seem to be related to electrical activity in the atmosphere, particularly during times of intense lightning activity. My main interest is in "cosmic magnetism" - magnets in outer space. Incredibly, magnetism is everywhere in the cosmos: planets, stars, gaseous nebulae, entire galaxies and the overall universe are all magnetic. What does it mean to say that a heavenly body is magnetic? For a solid body like the Earth, the idea is reasonably simple: the Earth's core is a giant bar magnet, with north and south poles. But farther afield, things get weird. Our entire Milky Way galaxy is also a magnet. Just like for the Earth, the Milky Way's magnetism is produced by electrical currents. But while the Earth has a molten core to carry these currents, our galaxy's magnetism is powered by uncounted numbers of electrons, slowly drifting in formation through space. The result is a magnet like nothing you've ever seen. Some of the oldest art in the United States maps humanity's place in the cosmos, as aligned with an ancient religion. A team of scientists has uncovered a series of engravings and drawings strategically placed in open air and within caves by prehistoric groups of Native American settlers that depict their cosmological understanding of the world around them. "The subject matter of this artwork, what they were drawing pictures of, we knew all along was mythological, cosmological," Jan Simek, an archaeologist at the University of Tennessee said. They draw pictures of bird men that are important characters in their origin stories and in their hero legends, and so we knew it was a religious thing and because of that, we knew that it potentially referred to this multitiered universe that was the foundation of their cosmology. If you've read about how modern cosmology may imply that, in an infinite universe, the existence of planets and the life forms that live on them must be repeated an infinite number of times, you may have been just a little bit skeptical. So are a couple scientists from Spain, who have posted a paper at arXiv.org criticizing the concept of the infinite repetition of histories in space, an idea closely related to the concepts of "alternate histories," "parallel universes," and the "many worlds interpretation," among others. The basic idea of the infinite repetition of histories in space is that, if you take yourself right now and change one thing (say make your red shirt a blue one), then there's another you somewhere who is exactly the same except for that one difference. A new paradigm for understanding the earliest eras in the history of the universe has been developed by scientists at Penn State University. Using techniques from an area of modern physics called loop quantum cosmology, the scientists now have extended analyses that include quantum physics farther back in time than ever before - all the way to the beginning. The new paradigm of loop quantum origins shows, for the first time, that the large-scale structures we now see in the universe evolved from fundamental fluctuations in the essential quantum nature of "space-time," which existed even at the very beginning of the universe over 14 billion years ago. The achievement also provides new opportunities for testing competing theories of modern cosmology against breakthrough observations expected from next-generation telescopes.